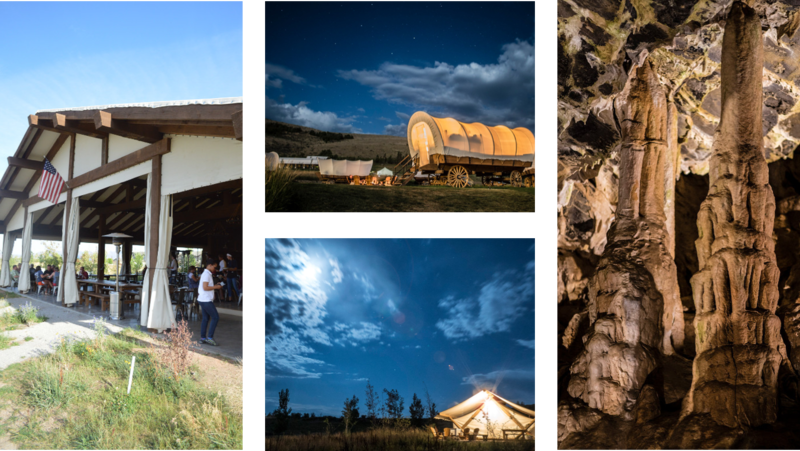 Last week, Camp Chef teamed up with Mel’s Kitchen Cafe, Favorite Family Recipes, Natasha’s Kitchen, and Dessert Now Dinner Later for a few days of crazy good food and the plushest glamping in northern Utah. 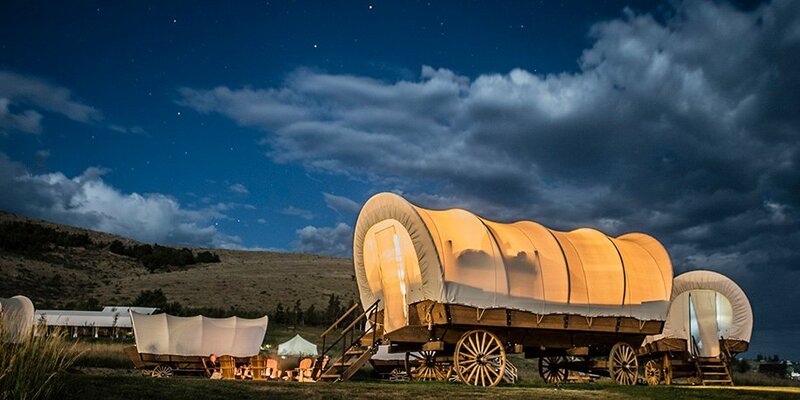 Tucked away in Garden City, Utah, you’ll find the teepee-style canvas tents and covered wagons of Conestoga Ranch. The “tents”—if that’s what you want to call them—feature king-size beds, fluffy pillows, pristine white sheets, hardwood flooring, and a full bathroom. You read that right: a clean, private, beautiful bathroom. We were far from roughing it, but that didn’t stop us from feeding our outside. From the hills of Conestoga Ranch, we had the perfect view of Bear Lake with its tropical-blue water—an unreal color for a lake in the middle of the mountains. We ventured from the camp up to Minnetonka Cave, named with a Native American word for “running water.” Huddled together in the cool 40º F cave, we listened to an earnest young tour guide point out stalactites, stalagmites, and other formations. The dim lighting, alien structures, and damp cold felt like another planet in the middle of a Utah summer. 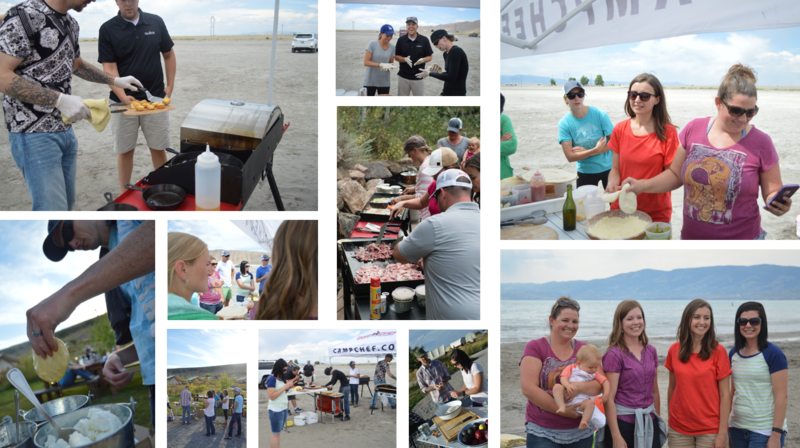 Afterward, we headed to the lake for some oven-baked pizzas on the beach. Cassidy, the head pizza chef of Conestoga Ranch, taught (or tried to teach) us how to toss pizza dough like a pro. We managed to keep all the dough off the sand, and some even made it into the oven. While the setting was gorgeous, what made the trip such a treat was the company. Vince, the executive chef of Conestoga Ranch, showed us how to whip up restaurant-worthy dishes on the fly (Literally—he made up the first recipe as he was cooking it). Inge took charge of the hospitality side of things, from grabbing extra utensils to cleaning up our messy cooking experiments. And of course, our food blogger guests were nothing short of delightful. We sincerely want to thank all of you! As a group of Camp Chef employees, food bloggers, and chefs, we all had one thing in common: a deep passion for good food. 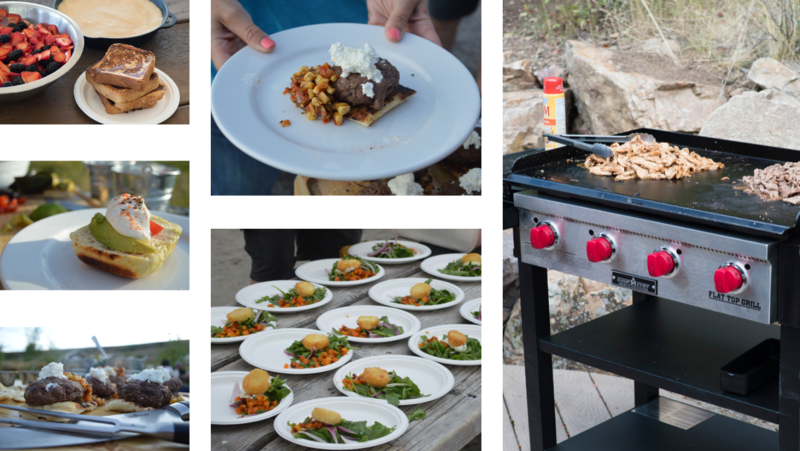 With an armada of Camp Chef stoves, grills, ovens, griddles, cast iron, utensils, and more we cooked some of the best food we’ve ever had. Homemade toast with avocado, plain Greek yogurt, and paprika; Wagyu beef sliders on flat bread with goat cheese and corn salsa; green eggs and ham pizza; smoked tri-tip—the list goes on. When you combine great products with genius cooking skills, the results are incredible. We couldn’t eat it all, but we couldn’t resist tasting everything. And that’s really the kind of Camp Chef experience we wanted to create. Good food, good people, good setting. The formula for feeding your outside isn’t rocket science by any means. But it’s one that we could all practice a little more in our lives, don’t you think? I’m ready to try some glamping-style cooking on our new Camp Chef grill.